April 10 - April 16 is National Volunteer Week. A wholehearted "Thank you!" to the many volunteers who give their time to help community organizations! If you're thinking about volunteering but not sure how to begin I can show you how. 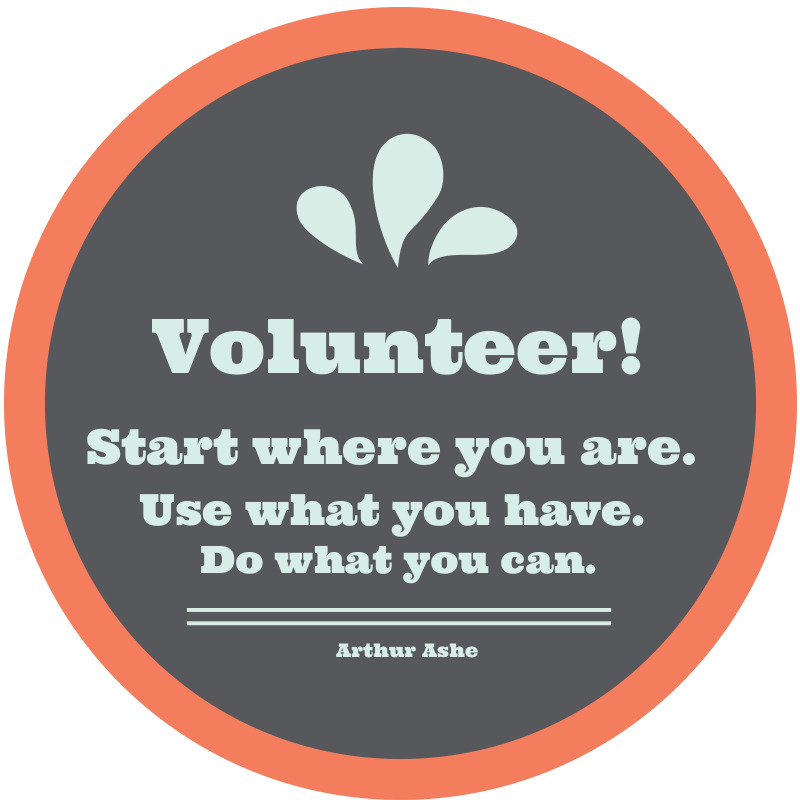 April 10 – April 16 is National Volunteer Week. A wholehearted “Thank you!” to the many volunteers who give their time to help our community! If you’re thinking about volunteering but not sure how to begin I can show you how. What are you good at? List all of your skills and talents. List ones you haven’t used in awhile too. If you used to make posters in high school but haven’t done it in a while, put it on the list it. If you used to sew but haven’t done it in a while, put it on the list. Some other skills are communication, critical thinking, mentoring or coaching, strong work ethic, dependable, creative, motivational, etc. What does your community need? This question seems to have an obvious answer but really think about the specific needs of your community. Your answer to this question is important and you may have more than one answer. If you’re not sure, Facebook is one of the best social media sites to start searching because all community service groups will have either a non-profit page or group page. Check Facebook first followed by Twitter. If you’d rather not search social media, then start with the community section of your local newspaper. However, not all organizations will post regular notices in the newspaper. How much time are you willing to give? Decide whether you have time during the day, during the week or the month. Maybe you’re only available seasonally, like during the Winter or the Summer months. Be honest with yourself about how much time you can truly dedicate towards volunteering. It’s very easy to over commit because most organizations are in desperate need of help. When you know your time availability this helps you keep your life balanced. Your time volunteering should feel rewarding and not a burden. Now look at your answers. Do you see a connection between your skills and what you love to do? Do you see where your skills and the needs of your community intersect? Let’s say you have a skill for training dogs, you love to be outdoors, you’ve found there’s a need for volunteers at a local animal shelter and you’ve determined you have approximately 4 hours monthly to volunteer your time. With this information, you can approach an animal shelter’s volunteer coordinator to offer your time and skills. In particular, The City of Stockton Animal Shelter currently is in need of volunteers. The person in this example could volunteer once a month at their pet adoption sites helping with handling the dogs, walking them, and comforting them. Let’s say you’re not really sure what your skills are but you know you love going to the movies with friends. You especially love discussing the movie afterward. In fact, you love it so much you usually post about it on your social media along with a photo or two of your friends having a great time. You’ve found that there are a lot of various needs in your community and you’re not sure which service or organization you’d like to start with. You did spend some time thinking about your availability and found that you usually have 1 weekend each month when you would be available to help. The person in this example has the budding skills of a communicator. Retelling a story, sharing a perspective, and posting on social media are skills. The next step would be to attend community events that interest you so you can get a sense of the organization and their purpose. When you’ve found an organization you can connect with, offer to work with their communications or social media point-person. Though you may spend a some time in the beginning learning their social media style you will want to make sure you are clear about the time you truly have available. In this example, once a month you could help cover an event on social media. Volunteering is a rewarding experience. Now you know how to begin!